Say what you will about hipster style, but the too-cool-for-school approach to dressing—mastered and perpetuated by those who call themselves "hipsters"—has had a pretty massive impact on street style, pop culture, and the world of fashion at large. Those who eschew anything considered too "mainstream," from the coffee they drink to the clothes they wear, have initiated a style that's all their own—and fashion is taking note. 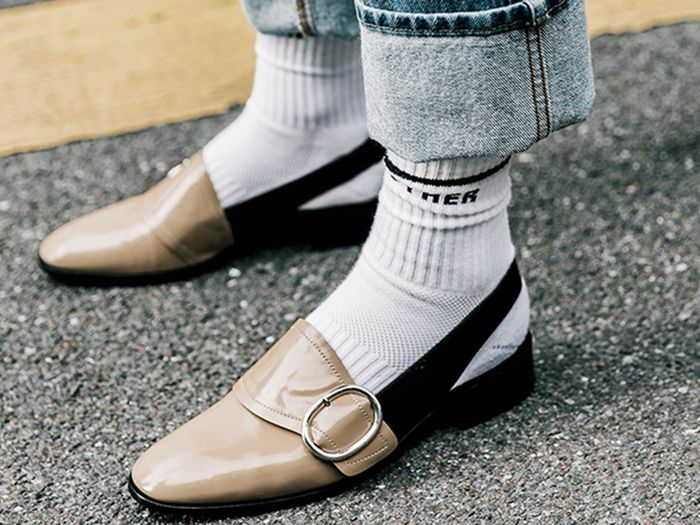 Everything from purposely distressed clothing to statement sweatshirts and Birkenstocks (pieces once exclusively worn by hipsters) has made its way into the chicest of circles. Considering this, we think there are certain elements of hipster style that when pulled off correctly, add up to a high level of taste. Distressed jeans are a fashion girl's go-to for laid-back style—especially those featuring frayed hems, light rips, or full-on blown-out knees. As far as shoes go, tough motorcycle-inspired boots lend an edgy vibe to the hipster wardrobe, making just about any outfit look cool. The hipster print of choice? Plaid. If you choose only one aspect of hipster style to copy, this should be it. Incorporate the cozy print into everything from blouses to skirts. When it comes to accessories, the hipster-approved pieces we love exude the effortless style this crowd is known for: cozy, oversize scarves and throwback wayfarer sunglasses. Scroll down for five easy ways to master the trending hipster style. Whether you're into full-on rips or delicately frayed hems, the distressed denim trend is one that hipsters lay claim to. Hipsters have long been patrons of the motorcycle trend—wearing everything from moto jackets to boots with aplomb. That said, a good pair of black moto boots is their real footwear claim to fame. Luckily, this is a trend that's easy to turn chic with the right dress, jeans or matching set. Available in sizes 5 to 14. Available in Italian sizes 36 to 41. If you were to ask 50 random strangers on the street what they think of when they hear the word "hipster," we'd be willing to bet that a good number of them would say plaid. Whether it's plaid button-down shirts, plaid shift dresses, or any number of items painted in a classic tartan print, hipsters adore plaid—and for good reason! The scarf, originally an element of Parisian sartorial culture, has been reappropriated by hipsters as the ultimate "cool" accessory. Even when the weather doesn't necessarily call for one, wrapping yourself up in a good scarf adds an instant air of effortlessness to pretty much any look. Yes, hipsters love their shades, but there's one brand of sunglasses that reigns supreme above all the others. Ray-Ban Wayfarers—the most iconic of American sunglasses—are a style long beloved by those who refer to themselves as hipsters. They also happen to be very wearable and adaptable to many different styles. Next up: Five chic ways to wear a blazer.